WASHINGTON - The US newspaper industry on Monday warned of a "duopoly" in online news by Google and Facebook, and called for legislation that would relax antitrust rules allowing collective negotiations with the internet giants. The News Media Alliance said that because Google and Facebook dominate online news traffic digital advertising, "publishers are forced to surrender their content and play by their rules on how news and information is displayed, prioritized and monetized." A statement by the association of some 2,000 media groups said news organizations "are limited with disaggregated negotiating power against a de facto duopoly that is vacuuming up all but an ever-decreasing segment of advertising revenue." 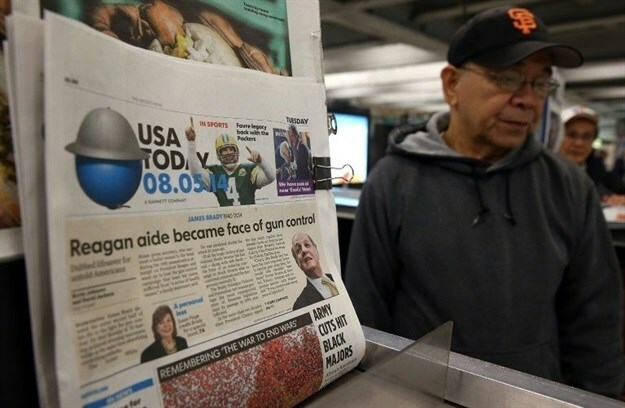 The group, formerly known as the Newspaper Association of America, includes large dailies like the New York Times and Wall Street Journal as well as hundreds of smaller media groups and regional news organizations. The request comes amid a prolonged slump in traditional print news, as readers increasingly turn to online platforms. News Media Alliance president David Chavern, writing in a Wall Street Journal commentary, said that the internet platforms "distort the flow of economic value derived from good reporting." He said Google and Facebook account for more than 70 percent of the $73 billion spent each year on digital advertising, and they eat up most of the growth, with nearly 80 percent of all online referral traffic coming from the two firms. "But the two digital giants don't employ reporters. They don't dig through public records to uncover corruption, send correspondents into war zones, or attend last night's game to get the highlights," Chavern said. "They expect an economically squeezed news industry to do that costly work for them." Facebook and Google, which share some revenue with news organizations on certain platforms, have been stepping up efforts to help media groups with grants and other programs. Facebook's head of news partnerships, Campbell Brown, said in a statement to AFP: "We're committed to helping quality journalism thrive on Facebook. We're making progress through our work with news publishers and have more work to do." Google said in a statement: "We want to help news publishers succeed as they transition to digital. In recent years we've built numerous specialized products and technologies, developed specifically to help distribute, fund, and support newspapers."